Following a mishap where I basically ripped part of Lurch's exhaust pipes and silencer off whilst doing a punch hunt the other weekend. I looked into replacing the pipes and silencer with original style parts. 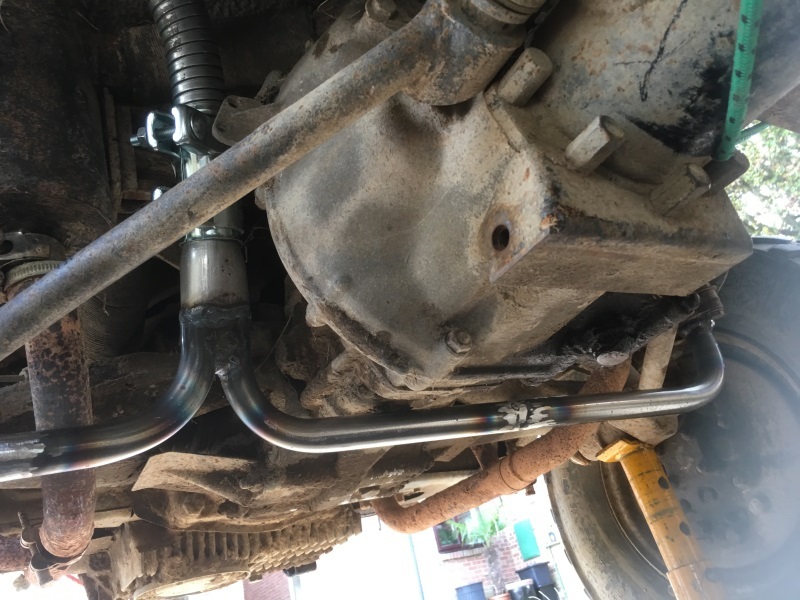 Unfortunately, as a lot of the other parts of the exhaust system would also have needed changing it was going to cost more than I can afford right at the moment. So I looked at other methods of repair / replacement. In the end I opted for buying some pre-bent bits of tubing and some flexible heating / exhaust pipe. 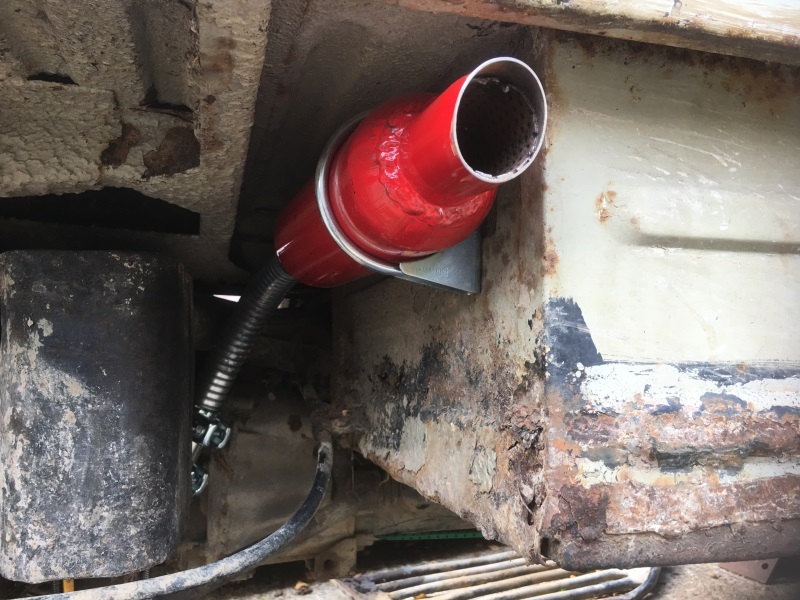 I already had a small "cherry bomb" silencer I had purchased last time I broke the exhaust at a Haflinger offroad event a couple of years ago. Started off by measuring how far down the pipes come from the heat exchanger mainfold (I only had the good nearside pipe to measure from), then I cut off the manifold mounting plate. Held another section of pre-bent pipe in correct position whilst my friend Stephen made some quick tack welds to hold the bits together. Same happened for the offside bit of pipe. Now I had two bits of tubing coming up next the gearbox as I thought if I was going to the trouble of putting this all together, I might as well get the silencer really up and out of the way. 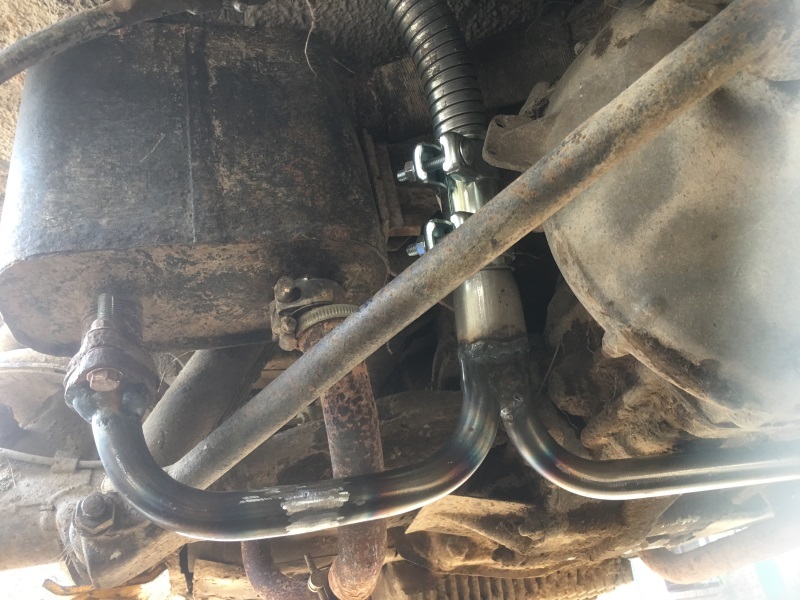 There are atleast a couple of other Haflingers out there with similar setups - why the original designers put the exhaust system below the sump guard on an offroad vehicle we will never know! Another off the shelf exhaust pipe reducer made a bit oval allowed me to do some measuring and then tack weld it two join the two pipes into one. Another off the shelf exhaust pipe joiner allowed me to put a length of flexible hose in the other end and bend it so I could fit the "cherry bomb" to the side of the footwell box. Once it was all tack welded in place, took it off and TIG welded and brazed the bits together. It's a bit noisier than I had intended, so I might have to stick something down it's throat! Atleast the only bits of exhaust system that are still vulnerable are the two bits which come down from the heat exchangers. Pictures below show it all fitted. good for another few years.